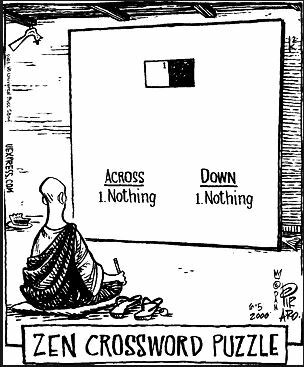 A koan is a riddle or puzzle that the Zen Buddhist use during meditation to help them unravel greater truths about the world and about themselves. Zen masters have been testing their students with these stories, questions, or phrases for centuries. Many koans can be traced back to the collections of sayings amassed by Chinese priests in the 12th and 13th centuries. Koans may seem like paradoxes at first glance. It is up to the Zen student to tease out their meaning. Often, after a prolonged and exhausting intellectual struggle, the student realizes that the koan is actually meant to be understood by the spirit and by intuition.